Oh man, what a crazy week! Sorry, I didn't do much blogging. I think I should have just set up a cot in my office and slept in there. Seriously, I feel like I haven't left work in a month! This last week I had 4 staff gone, and 3 of which were cooks. I only have 3 cooks. It was pure craziness. I need to send out a big shout out to my fill-in cook, Jordan. Between the two of us the kids got fed some delicious meals and we did pretty darn well if I do say so myself :). THANKS JORDAN and the rest of my staff that really stepped up and helped so that it wasn't crazy overwhelming. I need to remember to take a picture of all of us and post it on here so that I can brag about my awesome crew whom I don't know what I would do without. You guys are AWESOME! I have never cooked with ground turkey until this meal. I have always wanted to use it because it is much more healthy than ground beef and it is a great alternative. 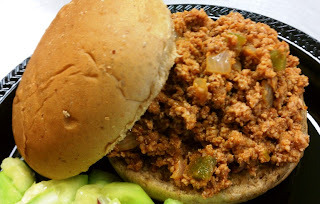 I was pleased with the way these sloppy joes turned out and I think I will start using ground turkey more often :). 1. Heat oil in large nonstick skillet over medium-high heat. Cook onion and bell pepper until softened, about 5 minutes. 2. Add turkey; crumble and cook until no longer pink, about 5 minutes; drain. Stir in chili sauce and Worcestershire sauce. Cook covered over low heat for 10 minutes. 3. Divide mixture evenly over bottom of buns. Layer on lettuce and tomato if desired. Top with remaining buns. Don't these look yummy?? If I didn't tell you there was turkey in there I bet you wouldn't even know! The look just like your normal sloppy joe on the street, but no way jose. These babies don't have nearly the amount of fat, and served on a whole wheat bun they are pretty much healthy. Do I dare say that word? ?